This is Roxy. She is a 4month old sable GSD. 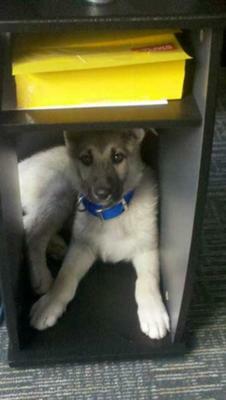 She loves to come to work with me everyday and has made this cubby in my desk her personal hiding spot. I absolutely love the picture that you have shared with us all here. Roxy is absolutely lovely. A fine specimen of a German Shepherd puppy, Roxy is beautiful. Hey there, Amanda. It is so good to hear from you today. And thanks to you so much for taking the time to come here and also for telling your German Shepherd puppy stories with us all today. Again - I just love the picture - she look soooooo happy just hanging out with you at the office! It's a shame she won't be able to use that particular spot for much longer since she'll soon out grow it. My own German Shepherd puppy (1 year old and around 100 pounds now) used to sleep under my desk (just under my feet) when I first got him but that only lasted a few weeks - now he's so big he has to lay down beside my desk even though he still wants to get up under there with me. It's still sweet though.